Iris series detectors maintain the ease-of-use of conventional detectors, yet are capable of providing a series of technical solutions that until today were provided by only the most sophisticated addressable analogue systems. As a result of advanced technologies based on new-generation microprocessors, these detectors implement a set of sophisticated algorithms capable of ensuring unequalled reliability and a high immunity to false alarms. The ground-breaking Versa++ technology incorporated in IRIS series detectors allows you to configure individual detectors to suit their specific environments and, when used in conjunction with the EITK1000 kit, to connect directly to the detector line for a complete diagnosis of each detector and thus test its operating capacity, verify its real-time values, view the contamination level in the optical smoke chamber and change its sensitivity and operating mode. Each detector has a non-volatile memory which allows you to view the smoke and temperature levels measured in the period prior to the last alarm detected. These detectors have passed - with flying colours - all the tests taken at the LPCB test facility, the prestigious English certification service. The ID100 optical smoke detector is based on the Tyndall effect (diffusion of light) and provides first-rate early warning in the event of fire. 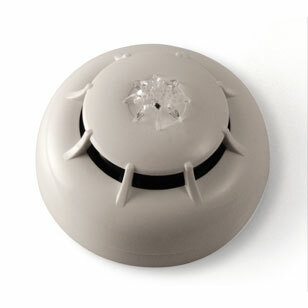 It offers wide-spectrum detection of smoke particles generated by the majority of fires. The newly designed optical chamber with sealed upper-part and 500 μm holes diameter mesh insect screen ensure high immunity to false alarms. The sensitivity can be configured to suit a wide range of applications (sensitivity configurable as: 0.08dB/m; 0.10dB/m; 0.12dB/m; 0.15dB/m). The response characteristics of the ID200 heat detector have been carefully set in A1R mode (fixed threshold at 58�C with thermovelocimetric detection). However, it can be set (by means of EDRV1000 driver) to operate in B mode (fixed threshold at 72�C); in A2S mode (fixed threshold at 58�C); in BR mode (fixed threshold at 72�C with thermovelocimetric detection). As a result of such flexibility, this detector is useful in places where the environment is dusty or smoky and the risk of false alarms is high.